Adam Putnam has declared a State of Emergency as a result of state officials finding an infestation of Oriental Fruit Fly in the Redlands in south Miami-Dade County. A quarantine extends over 87 square miles prohibiting export of fruit and vegetables from the quarantined area. The area supplies much of the nation’s winter vegetables. State officials have already destroyed 80 tons of fruits and vegetables grown in south Miami-Dade County. A copy of the State’s proclamation appears verbatim in a post below. This entry was posted in agriculture, Florida and tagged Commissioner of Agriculture, Florida, fruits and vegetables, Oriental fruit fly, Quarantine, Redlands on September 20, 2015 by Florida's Big Dig. At least to this author’s mind, one of the greatest enigmas in all of Florida history is the insertion in the 1868 Florida constitution of the “Gulf Stream” as the eastern boundary of the Sunshine State. It is unique among the state constitutions of every state in the Union. No other state uses an indefinite, amorphous and ever-changing geographical feature in describing at least one of its boundaries. 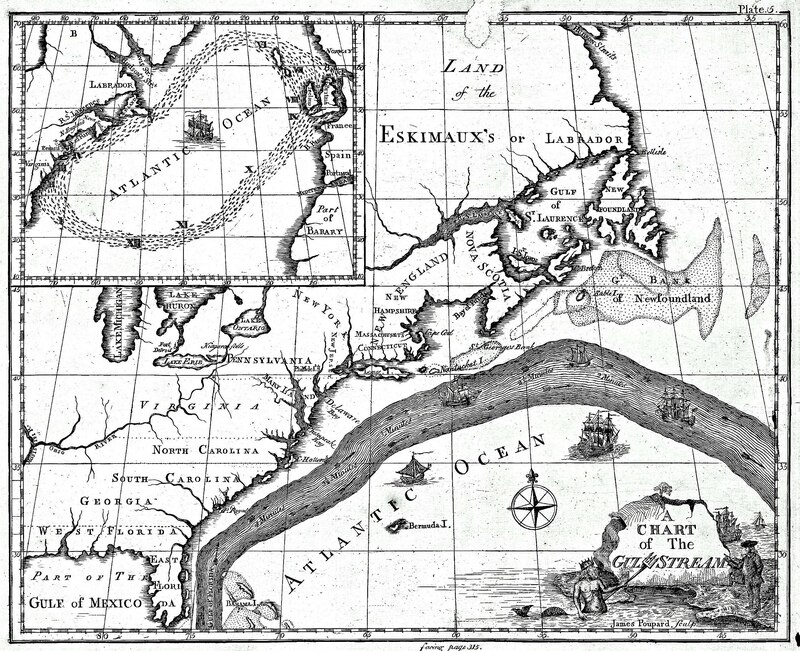 Benjamin Franklin was the first to map this feature in 1760. The stream runs as close as three miles and as distant as two hundred miles from the east coast. The feature changes so rapidly that in a single day, the Gulf Stream changes as much as ten or more miles in width. Other states use boundaries such as rivers to separate states or the banks of lakes to define their boundaries. Still others, like the coastal states, use statute miles or leagues from the shoreline to define their coastal boundaries, contemplating matters like the distances a cannon ball could be fired from an enemy ship. It’s true that the boundaries of rivers change–over time. But, generally, changes in the courses of rivers depend upon erosion and other natural, predictable, slow-moving changes over time. Second, the circumstances under which the “Gulf Stream” boundary was inserted remain a mystery subject to speculation. At the conclusion of the Civil War, before a seceding state could be readmitted to the Union, such state would be required to submit to Congress an acceptable constitution. In 1868, a duly constituted convention of delegates met in Tallahassee, at the Capitol, and adopted a conservative constitution. A group of radicals bolted the convention and met several miles away at the small town of Monticello. A new “radical” state constitution was adopted under guard behind closed doors. No complete set of minutes of those meetings survives. We only know that Congress accepted the “radical” constitution adopted at Monticello and readmitted the State of Florida back into the Union. The insertion of the Gulf Stream in the 1868 constitution survives to this day. Its usefulness is doubtful in light of federal law; but as a matter of state history, there it is. And it has never been changed. Some speculate Florida simply wanted to “flex its muscles”; others believe that the expansion was a protection of important fishing rights in disputes with the Bahama Islands. Nevertheless, it remains a conundrum without a resolution. Perhaps some day we may know the real reasons for the language. But for the moment, it remains a mystery. This entry was posted in Atlantic Ocean, Florida and tagged 1868 Florida Constitution, Benjamin Franklin, Gulf Stream on May 9, 2015 by Florida's Big Dig. William G. Crawford, Jr., author of the award-winning “Florida’s Big Dig,” is to be interviewed by Jason Dorman, a graduate of Flagler College, for C-SPAN 2 Book TV. The interview is to air the month of May, with a special emphasis on a showing throughout the weekend of May 16 through May 17, 2015. The story of the Florida link in the Atlantic Intracoastal Waterway, “Florida’s Big Dig” won the Rembert Patrick Award in 2008 for the Best Scholarly Book on a Florida history topic given by the Florida Historical Society. C-SPAN is in the midst of a campaign of focusing on the history of smaller cities and towns and their authors. This weekend C-SPAN has been taping in St. Augustine, Fla. This entry was posted in Atlantic Deeper Waterways Association, Atlantic Intracoastal Waterway, Books, Florida, Florida history, Inland waterways and tagged "Florida's Big Dig", C-SPAN, Jason Dorman, Jr., William G. Crawford on April 20, 2015 by Florida's Big Dig. This entry was posted in Atlantic Intracoastal Waterway, Florida, Rockledge, Steamboats and tagged "Saint Augustine", Indian River Lagoon, Intracoastal Waterway, Rockledge, Steamboats, stern wheeler on December 28, 2014 by Florida's Big Dig. By November 1912, according to the terms and conditions of the Settlement Agreement made in 1906, the last of twelve deeds had been delivered by the State of Florida Trustees of the Internal Improvement Fund (the State Cabinet) to the Florida canal company conveying in the aggregate more than one million acres of prime east coast land for dredging 268 miles of Intracoastal Waterway from Jacksonville to Miami. Under the 1906 agreement, state legislators had given the canal company more time to finish the waterway and more state land if the canal company dredged an additional 30 miles north of St. Augustine to Jacksonville. In 1914, many stretches of the waterway had not been completed to state specifications. The state had required a canal five feet deep and fifty feet wide. In many cases, embankments as in this photograph slid back into the water, requiring remedial work. At the same time, shippers, business and trade associations complained that the State should not have given the last of the twelve deeds for work that had not been completed or completed incorrectly. The photograph plainly shows a deficiency of retaining walls or their equivalent to keep dredged material from sliding back into the canal by 1914. Unfortunately, the State’s original specifications called for “maintenance” of completed work to be paid for out of toll money collected but little else in specifying precisely how the waterways were to be maintained. Courtesy, Boynton Beach Historical Society/Janet DeVries. This entry was posted in American Legal History, Atlantic Intracoastal Waterway, Boynton Beach, dredging, Florida, Florida Coast Line Canal and Transportation Company, Florida East Coast Canal, Florida history, Miami and tagged Atlantic Intracoastal Waterway, dredges, Fla., Florida, Florida Coast Line Canal and Transportation Company, Florida East Coast Canal, inland waterways, Intracoastal Waterway, Jacksonville, Jupiter Inlet -- Live Webcam, Miami, South Carolina, St. Augustine, Steamboat Saint Augustine, Waterway history, Waterways on September 7, 2014 by Florida's Big Dig. Short-statured Commodore Avylen Harcourt Brook ‘rescues’ President-elect Warren G. Harding aboard Brook’s 22-foot sloop “Klyo” after Harding’s houseboat cruising south on the New River Sound (now part of the Intracoastal Waterway) hits a snag “orchestrated” by Brook, the city’s unpaid public relations director, in 1921. 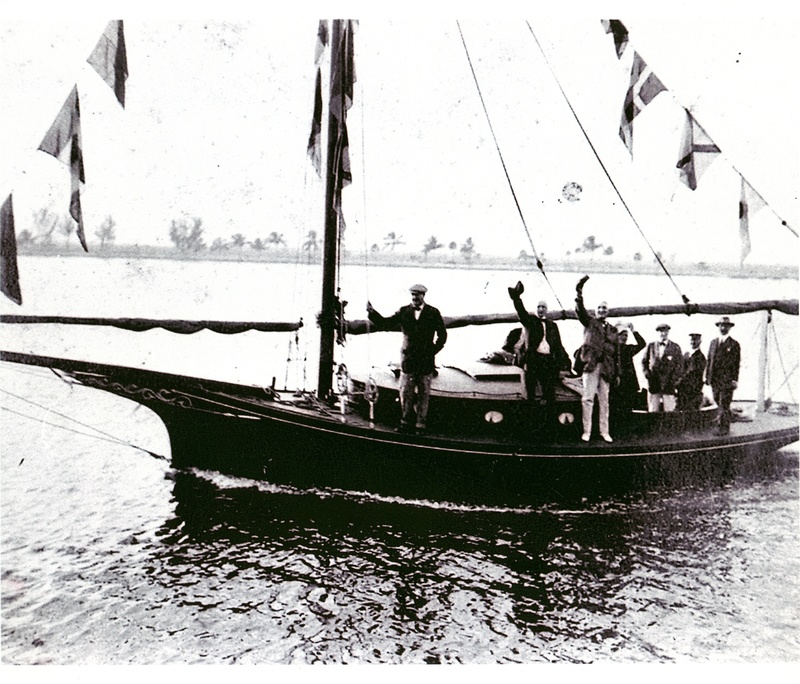 Harding (white pants, waving his hat) annually took Florida cruises aboard houseboats furnished by politicians and friends. (Courtesy, Ft. Lauderdale Historical Society). Whenever he was able, Harding played golf at the nine-hole Lauderdale golf links, a portion of today’s Fort Lauderdale-Hollywood International Airport, which during World War II was Naval Air Station – Ft. Lauderdale. The Station trained hundreds of pilots, bombers, and navigators, including the future U.S. President, George Herbert Walker Bush. This entry was posted in Atlantic Intracoastal Waterway, Com. Avylen Harcourt Brook, Florida, Fort Lauderdale, New River Sound, Waterway History on August 13, 2014 by Florida's Big Dig. There are seventeen varieties of the croton plant in Florida and other areas with subtropical climates. The croton is generally salt tolerant and thrives in alkaline soils. Croton grows relatively slowly and requires little care and maintenance. This entry was posted in Atlantic Intracoastal Waterway, Boca Raton, Boynton Beach, Daytona Beach, Delray Beach, Fla., Florida, Florida East Coast Canal, Fort Lauderdale, Hollywood, Miami, West Palm Beach on July 26, 2014 by Florida's Big Dig.